A fascinating game that will long live in some people’s memory, though I’m sure both managers and their defences will want to forget this showing quickly enough. It was passionate throughout, and after the visitors took a two goal lead midway through the first half, Charlton battled back to equalise after the award of two penalties. The second award saw the sending off of Jimmy Abdou, but it hardly diminished Millwall’s style of play, and in the second half, they gave as good as they got to equalise twice, the last goal coming well into injury time. It was Scott Wagstaff who was at fault for the first goal of the day, though both sides had seen chances go begging prior to the 12th minute opener. Wagstaff, tracking back, poked the ball past Sam Sodje 30 yards out and was then baulked by the big defender which allowed Morison to sneak in and slot past Rob Elliot. 12 minutes later it was 2-0, after a shot from a corner (that was harshly awarded) had come back off the woodwork, with Morison again poking home. The stunned Valley awoke after 35 minutes when Dave Mooney chased a lost cause only to be brought down by Frampton (left). This foul tackle certainly prevented a goalscoring chance, but the blue shirted player was not even booked by the fussy referee. Deon Burton despatched the spot kick high into the corner of the net, and a few minutes later he had another chance from 12 yards after a clumsy challenge on Lloyd Sam. This came about after Mooney had once more closed down the ‘keeper and won the ball off him, only to see his swivel shot curl against the post and bounce out. As Sam was about to pounce, he was caught form behind, and Abdou saw red, though it was certainly no worse than the Frampton foul for the first penalty. With the Addicks in the ascendancy on a bitterly cold afternoon, the half time whistle came, and most retreated to warmer areas of the stadium. Hopefully everyone was back in their seats for the resumption, as good work down the right between Elliot Omozusi and Sam saw a good first time cross from the winger nodded back by Mooney for Nicky Bailey to smash an unstoppable volley high into the top corner of the net (left). When they come to do the goal of the season in a few months time, there will be only one winner - that is unless we see something better in the next 25 games. Charlton annoyingly sat back after taking the lead, and even though they had a one man advantage it certainly didn’t look like it for long periods of that half. With both wingers closely marked and not able to settle on the ball, and with a couple of players having very poor games (Elliot and Grant Basey won’t want to look back on their performances with any pride, and Wagstaff and Christian Dailly also had indifferent afternoon’s), the away team took the game to Charlton. Most pressure was soaked up, and after Akpo Sodje came on for Mooney with 25 minutes left, breakwaways nearly took Charlton clear. The younger Sodje missed his kick when well placed, then saw a shot saved after bursting through the middle. It was a surprise then when Martin equalised with ten minutes left. 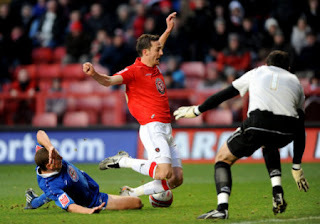 Back came the Addicks though, and after a corner was won and flicked on at the near post, the unfortunate Morison completed his hat-trick of goals in front of the Jimmy Seed stand by letting the ball bounce off his forehead and in off the post to give Charlton the lead again. Once more Charlton sat back, and once more Millwall scored in injury time as bad play saw Basey robbed on the edge of the area, and though Elliot saved the initial shot, Schofield buried the rebound. There was still time for Charlton to lose the game, but luckily they held on, and honours were even as the final whistle went. I do think that the match as an event got to some of the local players – Elliot, Wagstaff and Basey - and they will all need to learn to let heads rule hearts in derby games. The problem elsewhere was the amount of time on the ball the team had, which was virtually nil, and they will need to learn to pass the ball better and quicker to counter the closing down that some teams exert. While the midfield had its moments, too often the balls forward from Jose Semedo and Bailey were just punts, and that left Burton and Mooney fighting for scraps. The referee it should be noted will be vilified on Millwall message boards, but he hardly did Charlton any favours either, and was overly fussy and inconsistent throughout. The draw maintains the Addicks unbeaten home record stretching back to March, and the club find themselves sitting nicely in second place in the table over Xmas. At the end of the season, this could be seen as a point won, rather than two dropped. The other bad point to the day was finding out (ten minutes from the end of the match) that my wife had slipped on ice and that she has broken her elbow! That puts my Xmas plans into a state of flux, and with Lloyd Sam booked in this game, manager Phil Parkinson will now need to make an enforced change for the Boxing Day game against Swindon. This may well give one of the squad players a chance to stake their own claim for a place in the side, and competition can only be a good thing. Sorry to hear about your wife. I think you are very perceptive about the fact that this was a derby getting to some of the local players, although I have always been unconvinced by Basey: he can play well, but he can have a mare. Excellent report, wouldn't mind seeing Mckenzie on left Wagstaff on right for next game, Mckenzie showed some good pace and nice touches, Mckenzie, Burton and Money (if not too badly injured) will be a handful to contain. I thought Basey's form dipped (from average to poor) on Saturday when Sam went off; although McKenzie looked good bursting forward, he gave Basey little protection on the left I felt. Mooney, Burton and McKenzie do offer a significant goal threat but I fear that Mooney may be out for a while with his injury, hence his displeasure at coming off.